Percussion is one of the main categories of musical instrument, which includes all instruments that produce a sound when struck or shaken. 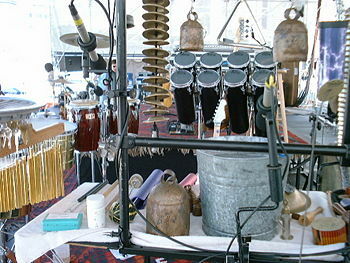 This encompasses a wide variety of drums, as well as ethnic percussion items such as cajons, accessory items like cymbals, and the standard array of keyboard instruments, including xylophones, glockenspiels and technically, the piano, since the sound is produced by a hammer striking a string. Flam - A single stroke accompanied by another, quieter, grace note played by the other hand just before the main stroke. Played in fast combination with other rudiments, the flam adds density and power to the rhythm. Drag (or ruff) - Similar to the flam, the drag is a single stroke preceded by two grace notes. Both grace notes are usually played by the same hand, with the other hand playing the primary stroke. The drag, like the flam, adds density and can be manipulated to sound more appropriate for a concert band setting (in which case the grace notes are very open and heavy) or a military setting (in which case the grace notes are tight and quick). Open Roll - A drum roll comprised of alternating bounces of two right and two left strokes. Quite simply, it would be written: RRLLRRLL... The open roll is precise; each stroke is intended to be heard individually, as opposed to a closed roll, where the strokes blend together. Often, an open roll will be begun by a flam or ruff. Different length open rolls (five stroke, seven stroke, nine stroke, thirteen stroke, etc.) are among the most common of rudiments. Closed Roll - A drum roll where each individual stroke is not meant to be heard. The strokes blend together and are played in no particular pattern. The drummer applied pressure to the stick as it strikes the head, so that when played together, both sticks create a wall of snare sound, rather than the precise alternations of the open roll. Paradiddle - A very common sticking pattern. It is: RLRR. To play a paradiddle, the drummer plays one stroke with the right hand, then one with the left hand, then two with the right hand. This pattern can be reversed for a 'left paradiddle', which has the exact opposite pattern. Paradiddles allow drummers to begin musical phrases on whichever hand they wish. For example, playing a right paradiddle (RLRR) leaves the drummer on the left hand for the next beat. Playing a left paradiddle (LRLL) leaves the drummer on their right hand. Percussion instruments are used in most forms of music, providing a rhythm for the other instruments to keep to, as well as dramatic sounds that can punctuate important passages of the music. In the modern orchestra, the percussion section often includes timpani and a range of smaller instruments such as triangles, bells and woodblocks. Percussion is particularly important in types of music, such as most Latin American and African styles, that place a strong emphasis on rhythm; these genres often use an array of traditional percussive instruments such as bongos and guiros. In recent years, some genres of popular music have abandoned 'real' percussion altogether in favor of drum machines, but the sounds these produce still have their roots in traditional drums and cymbals for the most part. Recently, the percussion keyboard instruments have gained popularity in band and orchestral settings. Marimbas and vibraphones act similarly to the piano. The percussionist can use four mallets to play chords as a piano player might, or provide additional volume to a melodic line by playing it on the keyboard along with the band. Percussion instruments are one of the oldest types of music-making device. Cymbals are often mentioned in the Bible, e.g. in Psalm 150:5. This page was last modified on 8 August 2016, at 13:44.